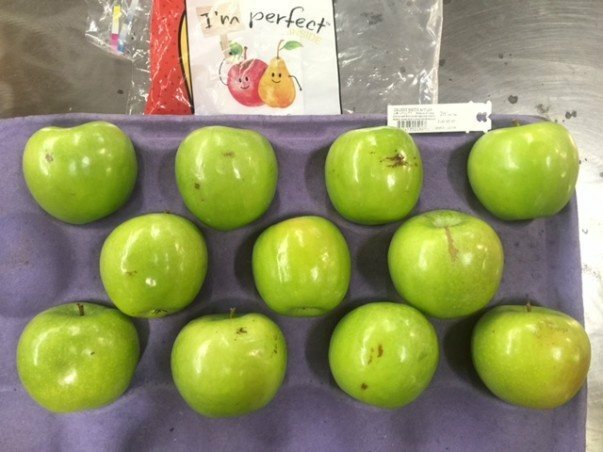 Earlier this week, Walmart announced in a blog post that it would start selling “beautifully imperfect” apples at some of its stores. The world’s largest retailer is the latest supermarket chain to start a rollout of “ugly fruits and vegetables” as more companies in the food industry realize they have to take a leading opportunity to reduce food waste and confront hunger in America. Depending on the source cited, anywhere from 30 to 40 percent of the food in the U.S. and other industrialized countries is wasted. There are several underlying reasons: poorly designed packaging, confusion over “use by” and “sell buy” dates, inefficient distribution and finally, the unreasonable expectations from retailers and consumers about what food should look like. On that last point, Walmart has admitted that it has contributed to this problem. Excuses such as disruptive weather and extended hot spells can ruin the appearance of fruits and vegetables. The problem is that anyone who has had the slightest experience with gardening, or is a regular visitor to farmers’ markets, knows that the best-looking produce is often the least flavorful -- and the ugliest is often the most scrumptious. For example, while consumers have long gone mad over the perfectly round watermelons sold everywhere from Target to Whole Foods, anyone knowledgeable about this fruit will know that the most scraggly looking one will most likely be the winner at the dessert table (look for that yellow spot and rough patches where bees are trying to go after its sugar). And what about the other pretty orbs that we have long coveted? Well, just remember what happened to the Red Delicious apple over time. Once the only apple available at grocery stores, this variety became so pallid and flavorless over the years that Americans fled this Washington State beauty for Galas, Honeycrisp and Fuji varietals, as detailed extensively on The Atlantic. The Red Delicious apple industry's collapse was so spectacular that it scored a long-forgetting federal bailout during the waning days of the Clinton Administration. Now this shimmering red globe is now exported abroad, while the rest are usually found on hospital lunch trays and at gas stations—where they stay until they find their usual destiny, the garbage bin, and are contributing to the ongoing food waste problem. But going beyond lofty “zero waste” goals, this change in attitude toward produce by the likes of Walmart is also an opportunity to address hunger. Not everyone can afford the far more expensive organic options; and they do not need to do so, as just about any nutrition expert will tell you it is not a question of conventional vs. organic, but just finding a way to eat more produce in the first place is a stop towards an improvement in public health while fighting obesity and other health problems. The problem with focusing on organics is that many people cannot or will not afford them, which means far worse options are eaten—or people just go hungry. Hence efforts by Walmart and other companies to educate consumers that ugly fruits and vegetables are indeed good for you are a positive trend. Even Whole Foods is in on this act—although the options I have seen at some locations are half-hearted, as they such produce options often priced only slightly below the “flawless” option, which is not enough of an incentives for their customers to drop such items in their shopping carts. For now Walmart’s “ugly” options are only limited to apples and a few other items at some of the overseas chains the company owns. But these initiatives can only make a difference if companies like Walmart not only add more options to their produce sections, but price them to sell quickly as well. And finally, these retailers must launch an aggressive effort in educating their customers or else these announcements will only prove to be a waste of time.